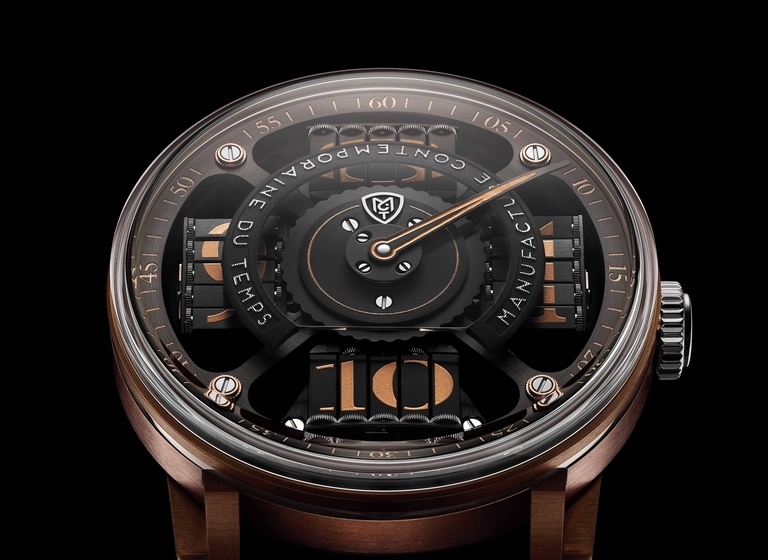 MCT Watches presents the Sequential Two – S200 Bronze, a 10-piece limited series forged from an alloy known for 5,000 years for its exceptional resistance: bronze. The Sequential Two – S200 Bronze combines the post-modern architecture of its dial with the patinated sensuality of its bronze case. Epitomising the encounter between age-old expertise – bronze metallurgy – and the latest horological technologies developed in the MCT Watches workshops, this elegantly sized model features a 44.6 mm-diameter round case. Anti-magnetic and resistant to wear, to deformation as well as to corrosion by seawater, bronze is a favourite material among ocean-going adventurers. An innovative surface treatment has enabled the teams at MCT Watches to stabilise the oxidation of bronze, thereby ensuring that the patina of the Sequential Two – S200 Bronze is equipped to withstand the test of time, both on land and at sea.